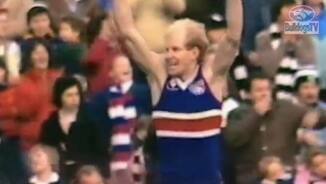 The #1 Moment in Whitten Oval history. 8th October, 1989. No game was played, but the ramifications of the event had far greater significance. The 'Save the Dogs' committee organized a rally to raise funds for the embattled Bulldogs to help stave off the VFL imposed merger with Fitzroy. Some 10,000 fans turned out with $450,000 raised to kick-start the 'Fight Back' campaign. 8th October, 1989. No game was played, but the ramifications of the event had far greater significance. Some 10,000 fans turned out with $450,000 raised to kick-start the 'Fight Back' campaign. Round 21, 1997 - "Welcome to the Kennel". 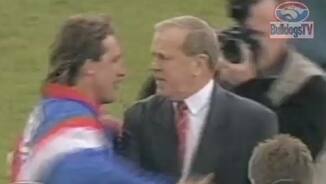 With these famous words - muttered by Daniel Southern as he greeted his young West Coast opponent, Michael Gardiner - all hell broke loose as fists flew before the start of the Bulldogs' last ever VFL/AFL game at the Whitten Oval. The rest they say is history as the Bulldogs went on to record an 18-point victory. Round 5, 1970 - In driving rain, Ted Whitten lead his charges to a memorable 3 point over Hawthorn in his 321st and last game, a then VFL record. 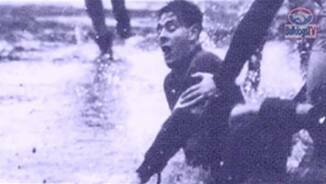 His ¾ time address to the players was captured by TV and immortalized in football folklore. 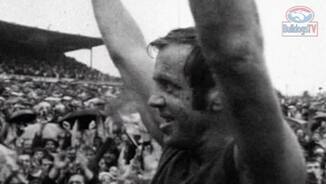 Whitten would later say, “I cried, but you couldn’t tell because it was raining." Round 13, 1978 - Kelvin Templeton kicked a club record 15 goals 9 behinds as Footscray set a new VFL record highest score in defeating St Kilda by 107 points, 33-15-213 to 16-10-106. Ian Dunstan also finished the day with a career high of seven goals. Pandemonium reached fever pitch in the last quarter when fans invaded the ground on several occasions as the Bulldogs, and Templeton in particular, went on a goal-kicking rampage. Round 17, 1994 - It was the changing of the guard, as Doug Hawkins broke the legendary Ted Whitten's Club Games Record. Pulling on the Bulldogs guernsey for the 322nd time, Hawkins exchanged a handball and a flick pass with the legendary Whitten before gathering 23 possessions in a best on ground display. 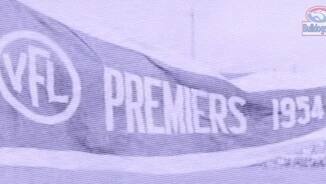 Round 2, 1955 - One of the biggest crowds ever at the Western Oval watched Mrs Grobbecker, wife of the Club President, unfurl the Bulldogs' 1954 VFL Premiership Pennant. To honour the occasion, the Bulldogs produced a scintillating win over Richmond in which champion full-forward Jack Collins bagged eight goals. 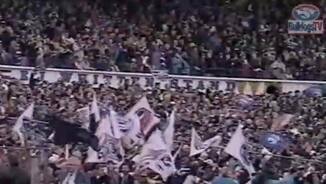 Round 10, 1984 - Trailing Collingwood by 37-points late into the third quarter, the Bulldogs staged an impressive comeback for an unlikely win. In a major faux-pas, Pies back-pocket 'Gubby' Allan, with seconds remaining, lobbed a kick across goal only for Simon Beasley to intercept the kick, mark and goal. While Jim Edmond reminded Allan of his blunder Beasley had sealed a remarkable five point victory for the Bulldogs. Round 11, 1991 - In typically abysmal Western Oval conditions the Bulldogs held Carlton goalless until the final minute of play when a dubious free kick was paid against Steve MacPherson to Carlton's Mark Arceri. Arceri slotted the sodden ball through the goals from 40 metres out to kick the Blues' first and only major of the match. Ironically, MacPherson had instructed his fellow defenders at the last break to make sure they didn't give away any unnecessary free kicks. The Bulldogs won the game 8-9-57 to 1-10-16, Carlton’s lowest score in almost 90 years. Footscray recorded its first victory in the VFL competition by beating South Melbourne 10-10-70 to 8-12-60 in its first home game at the Western Oval. This win was the last of an amazing run of 49 consecutive home game victories that began in the VFA in August, 1919. 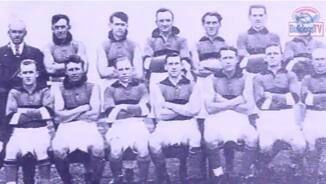 The Bulldogs faced Fitzroy in some of the most bizarre circumstances ever seen on a football ground. The Western Oval was awash with pools of water a foot deep in places, after a deluge of rain had blocked drains causing the playing surface to be partly submerged. In one of the more extraordinary scorelines, Footscray ran out winners 10-6-66 to Fitzroy’s solitary 1-0-6, the lowest score kicked that century.